Have you ever had the pleasure of smelling freshly baked bread in your house? There’s a good reason real estate agents tell their clients to bake bread when showing their place to potential buyers – nothing else makes a house feel more like home. But who has the time to bake bread from scratch? A bread maker can give you all the pleasures of homemade bread without the work, and we’re here to help you pick the very best machine. The right bread maker can help you get closer to your food, tailor recipes to accommodate a food sensitivity and produce fresh food tailored perfectly to your tastes…without any of the time-consuming hassle of kneading dough or cleaning a pile of dishes. Best of all, baking your own bread means that you know exactly what went into it! The Zojirushi Virtuoso is a truly impressive multi-tasking machine. Called the “Zo” by its fans, this reliable machine makes excellent bread – and so much more! With its horizontal form factor, the Zojirushi takes up a bit more counter space than some competitors, but its size allows it to produce an attractive and traditionally-shaped loaf of bread. Its larger, 18 x 10.5 x 12in footprint also provides space for two kneading blades, a unique feature that allows this machine to knead dough much more evenly than any other machine. This size also means that the Zo is able to make a 2-lb loaf, larger than the usual prepackaged grocery store loaf. Weighing in at a hefty 22lbs, the Zojirushi Virtuoso is probably not a machine that you’d like to pick up and move around very often. The combination of its weight and dual-blade design, however, means that this machine can stand up to the toughest doughs (note: for best results, make sure both kneading blades are facing the same direction when starting.) Owners report that it can even knead large patches of tough brioche dough ‘walking’ across the counter. The machine has a sleek stainless steel exterior with black accents. While the bulky black lid isn’t the most attractive feature, it does feature a large viewing window so you can keep an eye on your bread throughout the baking process. Best of all, the Zojirushi’s lid has an additional heater to ensure that your bread bakes evenly and with a gorgeous crust. With pre-programmed settings for basic bread, wheat bread, sourdough starter, and more, you’re covered for all the basics. If you have a favorite recipe of your own, or just want to try experimenting, the Zojirushi also offers three “Homemade” presets you can customize. While all of our top bread machine picks can knead and bake a solid loaf of bread, the Zojirushi is also a tremendous help if you’d like to hand-shaped breads like baguettes, braided loaves, or dinner rolls. Just add the ingredients and let the machine prep the dough for you. When you return in an hour or two, the dough will be mixed and perfectly risen, ready for you to shape it and bake it in your regular oven. You can also use the “shape cycle” to pause the machine after the dough has been kneaded, so you can mold the dough and then return it to the machine to finish rising and baking. The Zojirushi Virtuoso also includes a gluten-free bread setting, a feature that anyone who expects to bake a lot of GF breads should look for. Breads without gluten generally have a wetter dough, require additional baking time, and are sensitive to over-mixing, so having a dedicated setting is a must if you’ll be baking a lot of gluten-free bread. Of course, counterspace is precious for most of us. It’s hard to dedicate space to a machine that will do just one thing! That’s what puts the Zojirushi head and shoulder above other breadmakers. Its greatest strength is its flexibility, and if you’d like a unit that will do more than just bread, this is definitely the one to get. The Zojirushi includes preset programs for making donut dough, cookie dough, and jam. That’s not all, either – it can mix and bake a cake for you, prepare fresh pasta dough, and will even cook meatloaf for dinner! The Zojirushi also includes a delay timer of up to 13 hours, so fresh bread will be waiting for you whenever you’d like. Just add the ingredients before going to bed or leaving for work, set the timer, and the machine will automatically turn itself on when it’s time to get started. And with a 6-minute power failure backup, the Zojirushi can keep on baking even if the power falters. Programming and operation is simple and intuitive. The menu is easy to navigate, and even with the large variety of options at your disposal, it’s very straightforward to operate. Included in the box are a step-by-step manual, recipe booklet, and an easy-to-follow DVD with complete instructions on operating and cleaning your machine. Is there a catch? Well, perhaps just one – the bread pan and blades are not dishwasher-safe, and must be washed by hand. Both the pan and blades feature nonstick coatings to help make cleanup fast and easy. With its stunning good looks and clever features, the Breville Custom Loaf bread maker certainly earns its runner-up position. The Breville has a somewhat smaller footprint than the Zojirushi at 9.6 x 16.4 x 13.3in, and weighs in at just under 17lbs, making it an excellent choice if you have limited counterspace or expect to store the machine when not baking. 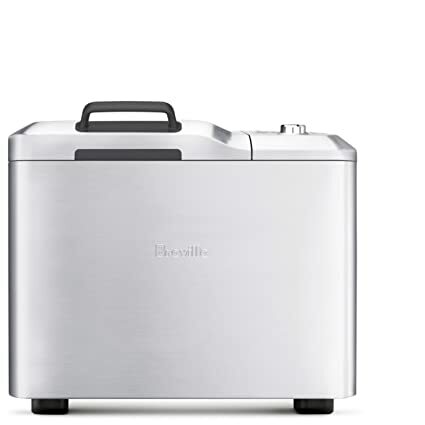 Despite its outwardly smaller size, the Breville can handle loaf sizes from 1lb to a whopping 2.5lbs, making it great both for those who want flexibility in their recipe size as well as those with larger families. The slightly more lightweight design does mean that the Breville can be prone to ‘walking’ across the counter when kneading heavier doughs, and the somewhat thinner walls of the unit can become hot to the touch while baking. Be careful when touching the top while it is operating, and consider putting down a damp towel to prevent movement when processing a large loaf or heavy dough. Like our top pick, the Breville has a huge range of programming options, including 13 automatic recipe settings, 9 programmable custom settings for your personal recipes, and the option to choose 3 different levels of crust color. The backlit LCD screen is clear and easy to read, and displays detailed information throughout the baking progress. A twist-and-click knob lets you scroll through menu options quickly, while a built-in viewing light lets you watch the bread through the large window in the lid during the entire process. The unit also has sound alerts, which can be left on to notify you of cycle completion or can be muted as desired. The Breville also includes a 13-hour preset timer and an optional keep-warm cycle, so you can have hot, fresh bread whenever you like. Custom settings are wonderfully varied, and the machine comes with 46 step-by-step recipes for everything from whole wheat to gluten free breads. With a ‘pause’ function, you can also use the Breville to knead your dough, then shape it as desired before baking. The most innovative feature in the Breville is the automatic fruit-and-nut dispenser. Many bread recipes with mix-ins require that they be worked into the dough towards the end of the kneading process, to avoid breaking them down by over-mixing. Most bread machines will sound a tone or otherwise notify you that it’s time to add mix-ins, but with the Breville, there’s no need. Simply fill the automatic dispenser on the top of the machine (it has a roughly ¾ cup capacity), and your fruit or nuts will be added at the right time. This is an especially fantastic feature if you plan on using the preset timer often – no need to get up in the middle of the night to add your mix-ins! The unique features of the Breville don’t stop there, however. In most bread machines, the kneading paddle must be pulled out of the bottom of the bread after baking, leaving an unsightly hole in your otherwise perfect loaf. Some machines also sound a tone to let you pull out the dough and remove the blade before baking, but that’s not a big help if you’ll be using the delay timer to allow the machine to bake bread when you’re not around. To minimize that problem, the Breville features a collapsible paddle that folds down out of the way during the baking cycle, reducing the hole left in your bread. While some users note that this isn’t effective when working with quickbreads, it can help with yeast-risen breads dramatically. Be warned, however – the collapsing blade can trap dough beneath it, making it a bit tricky to clean. In addition to the collapsible paddle, the unit also comes with a fixed blade for making jams. While the Breville features only one paddle and isn’t quite as robustly built or flexible as the Zojirushi, its clever fruit-and-nut dispenser and collapsing blade are great features for those who want a lot of flexibility out of their bread machine but don’t want to have to keep an eye on things during the baking process. There’s a lot to love about this attractive and fairly lightweight machine. At just 18lbs, the Conair Cuisinart isn’t too difficult to carry into storage when not in use, but it does have a sizeable footprint of just over 12 x 15 x 18in. To make storage easier, this unit has stay-cool handles that make it especially easy to pick up or to pull out from deep inside a cabinet. 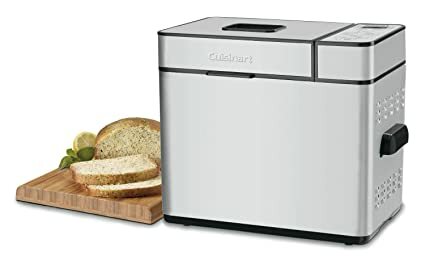 The Cuisinart includes a respectable 12 pre-programmed menu options, including basic selections like whole wheat and a range of specialty breads from gluten-free to sweet bread. Many owners report that this unit is particularly good at baking gluten-free breads. Our research found that users were impressed by gluten-free results regardless of whether they were using recipes that come with the machine, prepackaged mixes, or personal recipes. Options are available for 1, 1.5, and 2lb loaf sizes, and as with our number 2 pick, you can also select three different levels of crust color. The Cuisinart also offers several dough-only settings, allowing you to take advantage of the machine’s mixing and rising cycles before taking the dough out to shape and bake it as desired. This unit even includes preset cycles for cake and jam, making it a reasonably versatile machine. Uniquely, the Cuisinart also has a preprogrammed cycle for prepackaged mixes, so it’s especially perfect for those times when you truly just want to set it and forget it. The LCD display is on the small side, and is not backlit, but it does clearly display basic information during operation. A touch-sensitive control pad is used for selecting menu options, which some might like less than raised buttons, but the pad does make it very easy to wipe the machine clean. That’s a good thing, too, as the attractive stainless steel surface of the machine shows fingerprints readily, and will need frequent wiping to keep it gleaming. Cleanup is otherwise wonderfully simple with this machine, as the bread pan and mixing paddles can be put in the dishwasher, and the lid can be easily removed for cleaning. With a 13-hour delay timer, the Cuisinart is able to deliver fresh bread right when you want it. While it doesn’t have the Breville’s clever mix-in dispenser, the Cuisinart can be set to sound a tone when it’s time to add fruit, nuts, or any other ingredients. It will also alert you when the kneading is complete so you can remove the paddle, if desired, to prevent a hole in the finished loaf. Once the bread is finished, another series of beeps will sound, and the unit will automatically switch to the warming cycle to keep your loaf from getting soggy for up to an hour. For those who live in areas prone to brief power interruptions, the Cuisinart features an excellent 15-minute power failure backup function. The unit can remember which stage of breadmaking it was in, and resume right where it left off once power is restored. If you’re interested in using the delay timer and fear that power outages might interrupt baking, this is an excellent feature to have. Looking for a machine that’s fast and doesn’t take up too much room? Our budget pick, the Oster Expressbake breadmaker, delivers great bread quickly and for a very reasonable price. With a small footprint and upright design measuring in at 13.8 x 13 x 14.1in and a lightweight 8lbs, it won’t clutter your countertops, but it can still deliver quality loaves in 1lb, 1.5lb, or 2lb sizes. With a plain white plastic housing, the Oster perhaps isn’t as attractive as some of the other models on our list, but its straightforward control panel with raised buttons and a clear LCD screen do the job beautifully. For a small unit, it still has a surprising number of options. 9 bread settings are available, including basic, French, sweet, and European. Additional settings are available for jam and dough-only cycles. While this unit does NOT have a dedicated gluten-free setting, owners have reported success using the ‘wheat’ cycle with their gluten-free recipes. If you’re looking for a unit that can bake bread quickly, the Oster offers a unique ‘Expressbake’ setting that will produce bread from scratch in under an hour. This cycle cranks up the heat to produce a super fast loaf, but the manufacturer notes that the crust is likely to be a bit darker, and the loaf will be smaller and denser than bread produced using the regular settings. The Expressbake cycle is not suitable for all recipes, including most store-bought mixes, but recipes specially tuned for this option are included with the unit. For fresh bread anytime, this unit also has a programmable delay of up to 13 hours (although this option is not available with the Expressbake cycle, as the liquid ingredients would become too cool and the bread would not rise properly.) While the Oster doesn’t have an automatic mix-in ingredient dispenser, it will sound a tone at the right time for adding fruit and nuts. Like most of the top bread machines, the baking tray and blade are both non-stick and hand-wash only. All of the units we’ve picked make great bread, and give you lots of options to customize recipes. But to get the most out of your bread machine, it’s important to consider what kinds of bread you’d like to make – and whether you want to use your machine for more than just yeast-risen doughs baked right in the machine. The Zojirushi Virtuoso, our top pic, is the best choice if you’re looking for a well-rounded machine that can tackle any project. Not only can it make all the basic bread varieties you’d expect, but it has excellent pre-programmed settings for everything from cakes to specialty breads made using sourdough starter. The “Zo” also includes the option to add three infinitely variable “homemade” programs so you can quickly set up a program for each of your favorite recipes. It can even help cook dinner, with complete instructions for meatloaf and homemade pasta included with the unit. If you’d like to make gluten free bread regularly, each of our top three bread makers includes a dedicated gluten-free setting to handle the unique needs of GF dough. But if gluten-free recipes will be your main focus, note that owners report that our bronze pick, the Conair Cuisinart, produces especially tasty gluten-free bread. When checking the capacity of a bread maker, it’s important to consider not only how much bread you’ll need to make at a time, but whether you’ll need the flexibility to make different sizes from time to time. Our gold pick, the Zojirushi, is configured to produce a 2-lb loaf every time – a good size, but it may be too large for your purposes. Many users have reported success in making smaller sizes in their Zojirushi, but it’s still something to be aware of. Our other top selections offer a range of loaf sizes from 1lb on up. If you expect to be feeding a larger group, our silver pick from Breville is capable of producing a whopping 2.5lb loaf, perfect for large families or gatherings. Loaf size isn’t the only size consideration, however. You may not have enough counter space to leave your bread maker out at all times, so it’s important to consider whether you’ll be leaving your machine out for quick access, or storing it away in a cupboard when not in use. The Zojirushi weighs a fairly hefty 22lbs, which may make it a bit more difficult to pull in and out of storage than other, smaller models. However, since it can do so much more than just basic bread, it may be worth dedicating space to this versatile machine. The stay-cool handles of the Conair Cuisinart, our bronze winner, or the ultra-lightweight 8lbs of our budget pick from Oster may work better if you need to stash the machine out of the way most of the time. If you do want to leave the machine out, but don’t want it dominating the space, the 9.6×16.4” footprint of the Breville or the approximately 14×13” of the Oster are good choices for squeezing into small spaces. Are you looking for a bread maker that will truly let you set it and forget it? While each of our picks will let you program a delay of up to 13 hours so you can have fresh bread exactly when you want it, there are a few extra features to consider if you expect to be leaving the machine unattended often. The Breville, our silver pick, offers a fruit-and-nut dispenser that will automatically drop any mix-ins you desire into the dough at exactly the right time. And its collapsing blade means that you won’t have to wait for the right moment to pull the blade out to prevent holes in your loaf. If you’d like to bake a lot of bread with delicious ingredients stirred in, but don’t want to hover around the machine waiting for the right moment, the Breville’s clever design is definitely something to consider. If power interruptions are expected, consider a machine with a memory backup. The Zojirushi has a 6-minute backup, while the Conair Cuisinart can remember its settings for up to 15 minutes after a power outage, ensuring that your bread will still be waiting for you when you expect. Each of our top pics is straightforward to program, but for its simple-yet-sophisticated control design, the Zojirushi once again comes out on top. Depending on personal preference, some users do prefer the backlit LCD screen of the Breville to regular screens, and you may prefer the raised buttons available on our other pics to the touch-sensitive control pad found on the Conair Cuisinart. When it comes to clean up, all of our top pics offer non-stick surfaces, but most are hand-wash only. The bread pan and mixing blades of the Conair Cuisinart, however, can stand up to the dishwasher and the entire unit can be quickly wiped clean thanks to its touchpad button design. The Breville’s clever collapsing mixing blades help to reduce the holes present in the bottom of most machine-made bread, but since dough is prone to getting stuck beneath the blade, cleanup can be a bit more involved with this unit. While all four of these machines are solid performers, it’s hard to beat the Zojirushi when it comes to quiet and reliable operation. The Zo’s sturdy build keeps noise down and prevents it from walking across the counter even when working with thick, heavy doughs. Note that some owners have reported that the Breville can be a bit loud, and prone to wobbling when kneading thick doughs like brioche. 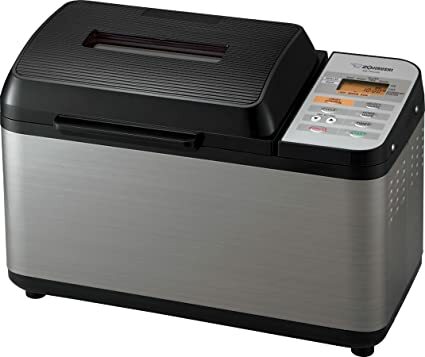 While you won’t go wrong with any of these fantastic bread machines, when it comes to features and reliability, the Zojirushi is hard to beat. If you don’t need the Zo’s advanced features, however, consider what types and sizes of bread you’re likely to make when making your selection. The Breville’s extra-large capacity and advanced options or the Conair Cuisinart’s robust power backup and easy cleanup are both excellent for those who want to make lots of great breads with minimal input. 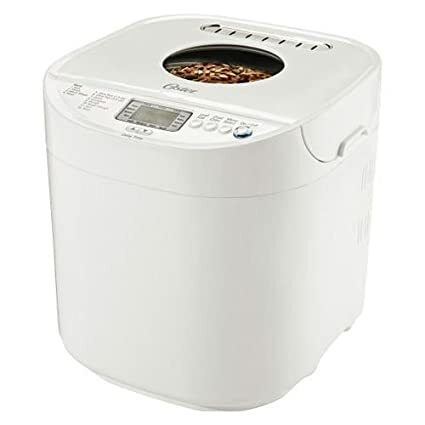 Our budget pick is a fantastic choice if you’re looking for an affordable unit to make simple breads and jams, or just want to see if a bread maker is right for you.